I wish I'd read this over the summer, when I was here in Oxford over the vacation - but better late than never! 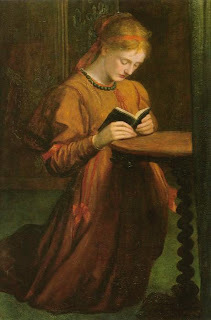 ...I am plain Elia - no Selden, nor Archbishop Usher - though at present in the thick of their books, here in the heart of learning, under the shadow of the mighty Bodley. I can here play the gentleman, enact the student. To such a one as myself, who has been defrauded in his young years of the sweet food of academic institution, nowhere is so pleasant, to while away a few idle weeks at, as one or other of the Universities. Their vacation, too, at this time of the year, falls in so pat with ours. Here I can take my walks unmolested, and fancy myself of what degree or standing I please. I seem admitted ad eundem. I fetch up past opportunities. I can rise at the chapel-bell, and dream that it rings for me. In moods of humility I can be a Sizar, or a Servitor. When the peacock vein rises, I strut a Gentleman Commoner. In graver moments, I proceed Master of Arts. Indeed I do not think I am much unlike that respectable character. I have seen your dim-eyed vergers, and bed-makers in spectacles, drop a bow or a curtsy, as I pass, wisely mistaking me for something of the sort. I go about in black, which favours the notion. Only in Christ Church reverend quadrangle I can be content to pass for nothing short of a Seraphic Doctor. The walks at these times are so much one's own, - the tall trees of Christ's, the groves of Magdalen! The halls deserted, and with open doors, inviting one to slip in unperceived, and pay a devoir to some Founder, or noble or royal Benefactress (that should have been ours) whose portrait seems to smile upon their over-looked beadsman, and to adopt me for their own. Then, to take a peep in by the way at the butteries, and scullieries, redolent of antique hospitality; the immense caves of kitchens, kitchen fireplaces, cordial recesses; ovens whose first pies were baked four centuries ago; and spits which have cooked for Chaucer! Not the meanest minister among the dishes but is hallowed to me through his imagination, and the Cook goes forth a Manciple. Antiquity! 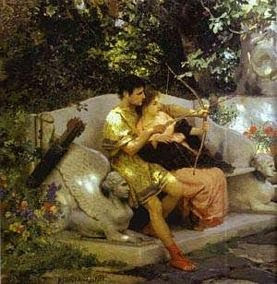 thou wondrous charm, what art thou? that, being nothing, art everything! When, thou wert, thou wert not antiquity - then thou wert nothing, but hadst a remoter antiquity, as thou calledst it, to look back to with blind veneration; thou thyself being to thyself flat, jejune, modern! What mystery lurks in this retroversion? or what half Januses are we, that cannot look forward with the same idolatry with which we for ever revert! The mighty future is as nothing, being everything! the past is everything, being nothing! What a place to be in is an old library! It seems as though all the souls of all the writers, that have bequeathed their labours to these Bodleians, were reposing here, as in some dormitory, or middle state. I do not want to handle, to profane the leaves, their winding-sheets. I could as soon dislodge a shade. I seem to inhale learning, walking amid their foliage; and the odour of their old moth-scented coverings is fragrant as the first bloom of those sciential apples which grew amid the happy orchard. Still less have I curiosity to disturb the elder repose of MSS. Those variae lectiones, so tempting to the more erudite palates, do but disturb and unsettle my faith. I am no Herculanean raker. The credit of the three witnesses might have slept unimpeached for me. I leave these curiosities to Porson, and to G.D.* - whom, by the way, I found busy as a moth over some rotten archive, rummaged out of some seldom-explored press, in a nook at Oriel. With long poring, he is grown almost into a book. He stood as passive as one by the side of the old shelves. I longed to new-coat him in russia, and assign him his place. He might have mustered for a tall Scapula. D. is assiduous in his visits to these seats of learning... D. is delightful anywhere, but he is at the best in such places as these. He cares not much for Bath. He is out of his element at Buxton, at Scarborough, or Harrowgate. The Cam and the Isis are to him 'better than all the waters of Damascus.' On the Muses' hill he is happy, and good, as one of the Shepherds on the Delectable Mountains; and when he goes about with you to show you the halls and colleges, you think you have with you the Interpreter at the House Beautiful. OK, let's see if I can explain this thought coherently; I'm fluey and word-deprived. Good advice - at least, it's working for me. I haven't seen any angels, but... well, something close. Anyway, today is the feast of St Simon and St Jude, two apostles about whom real information is hard to come by. Everyone knows St Jude, patron saint of hopeless causes (what is it about that which so attracts the imagination? ), but St Simon is even more obscure than his obscure companion. The Catholic Encyclopedia entry on him notes what little information there is. "Simon Zelotes was one of the original twelve disciples of Christ. His first visit to Britain was reportedly in the year 44 A.D. during the Claudian War. Evidently his stay was short at this time and he returned to the continent. In 60 A.D. Simon was recruited by Joseph of Arimathea in Gaul at the beginning of the Boudicean War. Simon arrived in Britain during the first year of the Boudicean War (60 A.D.) when the whole island was convulsed in a deep, burning anger against the Romans. It is recorded that Simon was unusually bold and fearless, as his name implies. In spite of the turmoil seething through Britain during the Boudicean War, Simon openly defied the Edict of Paulinus, and the brutal Catus Decianus, to destroy anything and anyone Christian. Simon decided to conduct his work in the eastern part of the Island. This section of Britain was the most sparsely inhabited by the native Britons and consequently more heavily populated by the Romans. He was far beyond the strong protective shield of the Silurian arms in the south and the powerful northern Yorkshire Celts. In this dangerous territory Simon Zelotes was definitely on his own...The evangelizing mission of Simon was short-lived. He was finally arrested under the orders of Catus Decianus. As usual his trial was a mockery. He was condemned to death and was crucified by the Romans at Caistor, Lincolnshire, and buried there on 10 May, 61 A.D."
This is nonsense, of course, but in the light of Francis Thompson and medieval imagination, which I've written about before (and it's complete coincidence that that post also mentions Caistor, perhaps the only two occasions in my life I've given any thought to the place): anyway, in that light, I have to praise a religious mind which can conceive of apostles martyred, not in Edessa, but the Fens. Some snippets of Langland on charity, a kind of meditation on 1 Corinthians 13. The dreamer is questioning Anima, a personification of the rational faculty of the soul. There's a lot more to it than this, but these are my favourite bits of the dialogue. Withouten fauntelte or folie a fre liberal wille." Hic in enigmate, tunc facie ad faciem. As of a tunycle of Tarse of of trie scarlet. And if he soupeth, eteth but a sop of Spera in Deo. Loveth hem as Oure Lord biddeth and loketh how thei fare. And seintes yset - stille charite hem folwede. Ac I ne lakke no lif, but, Lord, amende us alle. And gyve us grace, goode God, charite to folwe! In pace in idipsum dormiam &c.
Misdooth he no man, ne with his mouth greveth." "Many men lived in tents, disdaining to sleep in houses lest they should become soft; so that the Normans called them 'wild men'" (silvatici). "At this time certain Norman women, consumed by fierce lust, sent message after message to their husbands urging them to return [from England] at once, and adding that unless they did so with all speed they would take other husbands for themselves. For they dared not join their men themselves, being unaccustomed to the sea-crossing and afraid of seeking them out in England... [The men] returned to Normandy to oblige their wanton wives; but neither they nor their heirs were ever able to recover the fiefs which they had held and chosen to abandon." To bide a blysful blusch of þe bryȝt sunne. Watz cumen wyth wynter wage. With the first pledge of winter. According to the OED, the 'Michaelmas moon' is another name for the harvest moon, the first full moon after Michaelmas Day. ... one last bonus fact about St Edward the Confessor, since today is his actual feast. The translation of his relics (of which today in the anniversary) in 1163 in Westminster Abbey was presided over by none other than Archbishop Thomas Becket, in the days before he was Canterbury's own St Thomas. And Ailred of Rievaulx, in the days before he was St Ailred, wrote a vita of St Edward for the occasion. A cloud of witnesses, indeed. "God made Sun and Moon to distinguish seasons, and day, and night, and we cannot have the fruits of the earth but in their seasons: but God hath made no decree to distinguish the seasons of his mercies; in paradise, the fruits were ripe, the first minute, and in heaven it is always Autumne, his mercies are ever in their maturity." John, I know you were speaking metaphorically, but if turns out to be always autumn in heaven I think I would be OK with that. 9: He turned people into leeks. "It happened another time that when king Edward was sitting on his throne, a crippled man came before the door of his lodging and said that Peter the Apostle had sent him thither, and that Peter had told him that the king himself should bear him to Peter's church, and then he would be cured. When this was told to king Edward he went to him, and heard these words himself from the man's mouth. And, showing his faith and humility, he took the man up in his arms and bore him to Peter's church in London, and set him down there. Then the crippled man was made whole and upright as a leek." Upright as a leek in Old Norse = réttr sem laukr. A leek to an Old Norse writer was a rather more dignified object than we might imagine today: a noble, straight-limbed, smooth kind of thing, fresh and young and green (compare this poem from the Edda). Apparently there is still a Scottish proverb "as clean as a leek", meaning, according to the OED, "perfectly, completely, entirely". That's the same sort of idea as we've got here. Leeks aside, this is a lovely story. Edward the Confessor was the first king of England of whom it was said that he could cure illness by his touch, in particular the sickness later known as 'the king's evil'. Shakespeare has him doing this off-stage in Macbeth, and you may know that Tolkien borrowed this medieval legend for Aragorn in The Return of the King, where it's said in the ancient lore of Gondor that "the hands of the king are the hands of the healer". Aragorn's healing touch reveals his royal identity, and takes us from leeks to Tolkien in two easy steps. 8. He had a lot of visions. One day he was in church and at the moment of the elevation, he burst out laughing. Afterwards, the people around him asked what was so funny. Edward said he had seen a vision: "The king of the Danes was making preparations with a countless army and a great fleet of ships to come and harry our land, and just as he was stepping up into his ship from a boat, he fell overboard and was drowned." Not the funniest story I've ever heard, but it has a certain slapstick charm. (These slightly bizarre stories are found in the earliest lives of Edward, and also in the fourteenth-century Icelandic saga about him, Játvarðar saga). 7. King Edward agreed to marry Godwin’s daughter Edith (Eadgyth) as a gesture of reconciliation after his brother’s death. 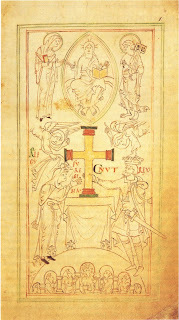 Medieval writers are divided on whether Edith shared the difficult temperament exhibited by her father and brothers: one chronicle (a forgery, but possibly based on an authentic source), praises her generosity and sweet nature, and quotes a line of verse written about her which marks the difference between her and her family: "sicut spina rosam, genuit godwinus egitham" (roughly: 'as thorns [bring forth] roses, so did Godwin beget Edith'). Others considered her, in the words of Edward's modern biographer Frank Barlow, "a determined woman, interfering, hard, probably bad-tempered". Either way, it was not a successful marriage. It followed the course of Edward's troubled relationship with the rest of Godwin's family: when Edith's brothers were exiled for their disruptive behaviour, he put Edith aside; when they returned, he took her as his wife again. But the marriage produced no children and tradition says it was never consummated. For this reason, Edward is the patron saint of troubled marriages and separated spouses. 6. 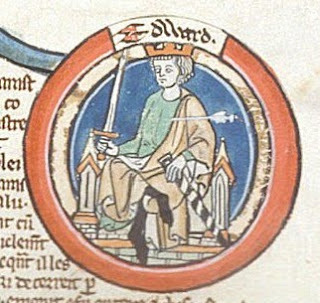 Edward's younger brother Alfred, who had shared his exile, visited England in 1036. Cnut had just died, and Alfred came to see their mother the queen, but before he reached her he was waylaid by Earl Godwin, one of the most powerful noblemen in England. Godwin had been a supporter of Cnut, and probably thought his best chance of continuing influence was to help one of Cnut's sons to power - which meant eliminating the English claimants to the throne would work in his favour. He later denied all involvement in what happened next, but his guilt was widely accepted. He met Alfred just outside Guildford (Alfred was on his way to his mother at Winchester), captured him, killed or mutilated most of his men, and blinded Alfred with a red-hot poker. Alfred, mortally wounded, was taken to the monks at Ely, where he died some time later of his injuries. Alfred was the last of Edward's many brothers, and his death affected both Edward and his mother deeply. However, Godwin was a formidable man to have as an enemy, and when Edward eventually became king he found he needed the support of Godwin and his family. So they were reconciled, but Edward apparently never forgot what Godwin had been accused of with regards to Alfred's death. And then, the story goes that one day in 1053 King Edward was at a feast with Godwin at Winchester, and Edward’s serving-man, while carrying wine to the table, slipped and saved himself from falling by stretching out his other foot. Godwin said, "See how one brother has helped another!" (This was a proverb; the two feet are like two brothers, which aid each other in need). The king looked at him and said, "So would my brother now be able to aid me, had it not been for your treachery." Godwin said to Edward, "I see that at every reference to your brother, you look at me with an angry frown," and he held up a piece of bread and swore, "but may this morsel choke me, if I am guilty of his death!" He swallowed the bread, choked on it, and died. ... when you have dreams in which you analyse the etymology of Anglo-Saxon personal names. "The knowledge of wickedness is not wisdom, neither at any time the counsel of sinners prudence." It can be hard to tell the difference between knowledge and wisdom; and it can be very difficult for a person like me, whose besetting sin is pride in her intellectual accomplisments (such as they are), to remember that knowledge has its proper limits. Or maybe you did, what do I know. 5. After the death of Edward's father Ethelred, his mother married Cnut, king of Denmark, the man who had replaced Ethelred on the English throne. This would have made for some awkward family Christmasses, except that there isn’t any evidence that Edward ever met his stepfather. When Cnut was dead and there was some confusion over the succession, Queen Emma is said to have supported the claim of Magnus, king of Norway, over that of her son. She was popularly accused of all kinds of scheming against, well, anyone who wasn't Harthacnut, the son she had with Cnut. 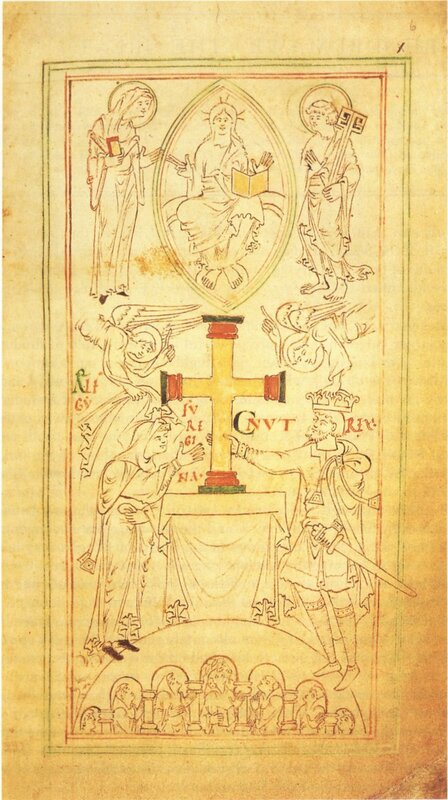 After he became king, Edward, in a supremely unsaintly act, had his mother's property and lands seized, supposedly because of her support for Magnus. It was a political mess but also, I think, rather a sad situation all round. And what we think to do. O God of mercy, take. Good Lord, Thy help extend. Bow down Thine ear and hear! Open Thine eyes and see! What Thou wouldst have it be. 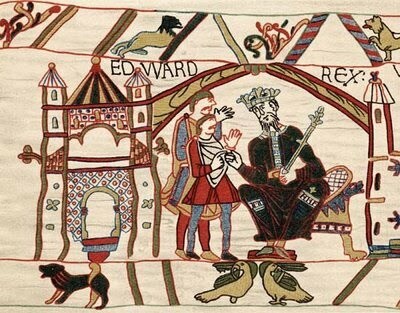 Edward in the Bayeux Tapestry, because the Norman Conquest was all his fault. 4. Edward is often called "the last Anglo-Saxon king",* but I don't like that designation (this may be more 'a thing you didn't know about me' than about Edward). 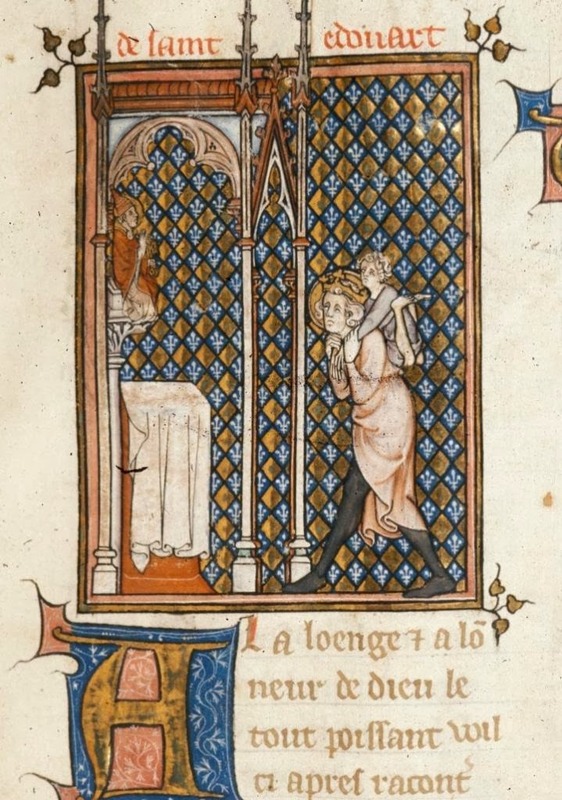 Yes, he was the son of an Anglo-Saxon king, but by blood and inclination he was Anglo-Norman: his mother was Norman, and he spent 25 years in exile in Normandy before becoming king of England. When he returned to England in 1041, he barely knew the place; he hadn't seen it since he was a teenager, and I'd love to know what kind of English he spoke at that point - future patron saint of the English! He brought Norman priests and noblemen with him, and didn't get on very well with the Englishmen who had served Cnut (more of that tomorrow). So it might be more accurate to call Edward's valiant elder half-brother, Edmund Ironside, the last Anglo-Saxon king. Edmund died in 1016, having given half his kingdom to Cnut; then there were three Danish kings of England, Anglo-Norman Edward, and, in 1066, Norman William. Not a Saxon among them. The eleventh century was awfully complicated - but so much fun. *The other two kings of 1066 notwithstanding: poor uncrowned Edgar Atheling doesn't count, and Harold Godwinsson certainly doesn't. Do you come from Bardney? Bardney is a village a few miles east of Lincoln. It was the site of an Anglo-Saxon abbey, and in 679 Osthryth, queen of Mercia, wanted to transfer the bones of her uncle St Oswald to Bardney. The monks, showing a surprising degree of incipient regionalism, refused to accept the relics on the grounds that Oswald, when king of Northumbria, had conquered Lindsey (the Anglo-Saxon kingdom comprising part of modern-day Lincolnshire). The monks shut the abbey gates against St Oswald's bones and refused to allow the coffin in, but during the night a pillar of light shone out above the body (a common motif; a similar pillar helped reveal the location of the body of Edward the Martyr). The monks, recognising a miracle when they saw one, realised that Oswald really was a saint and they had been wrong to leave him outside, so after that they always left their gates wide open (some say, removed them altogether). Hence the saying. Thorney, the flower of the fen country. These were compiled by contributors to Notes and Queries vi (1852), in the days when such antiquarian delights still counted as academic scholarship. If only they still did! I found this in 'Hymns Ancient and Modern', and am particularly fond of the second and third verses. Wikipedia has an exceptionally (rather bizarrely) detailed article on the author, Bishop Mandell Creighton, out of which mass of information I chiefly, sentimentally glean that he first spoke to his future wife at a Valentine's Day luncheon in Brasenose College, Oxford. That was in 1871 and he didn't write this hymn until 1900, but perhaps we can claim the germ of it for Brasenose. To beautify each coming day. Because their love points up to Thee. 3. Edward's uncle, also called Edward, was a saint too. Edward-the-uncle was murdered at the age of 13 by his stepmother (the grandmother of Edward the Confessor), who wanted her own son to be king. Her son, Ethelred the Unready, was too young to have had a hand in the murder, but it haunted the early years of his reign, and some people believed that his later deposition at the hands of the Danes was God's punishment for the murder of Edward. Bonus fact you may, actually, have known: not only was Edward the Confessor nephew to a saint, he was also the great-uncle of St Margaret of Scotland. 2. He was born at Islip in Oxfordshire, about five miles from where I'm currently sitting. In honour of the feast of St Edward the Confessor, nine days from today, I'm going to post nine facts about my favourite saint which you may not know. If you do, I apologise sincerely for redundancy; it's an academic's ever-present trap. 1. In total, from his parents' two marriages, Edward had nine brothers and at least six sisters. All seven of his half-brothers on his father's side were dead by the time he was fifteen, and in the end Edward outlived all his brothers by more than twenty years. Over the summer I visited the church of St Nicholas in Ash, east Kent - a large church in what is now a little village. It's a medieval church with numerous beauties, scattered around a roomy building which feels almost like a series of stone barns which have been loosely joined together; but having duly admired the medieval brasses, stone effigies, and alabaster monuments, which did delight my academic's heart, my sentimental Victorianist's eye was caught by this window in the south transept. In a grey church, this was a ray of rich colour. It was rather hidden away behind something (the organ? I can't quite remember), and I couldn't manage to find out who made it or to whom it was a memorial. It doesn't matter; I rather fell in love with it. This is a shocking confession, but the splendour of Victorian-revival-fake-medievalism is just as dear to me as real medieval art. I think the names below these figures say "John Keriell" and "Wife of Keriell" (!) but who they might have been, I don't know. Doubtless the heraldry would give it away to a person learned in such matters. I was just touched by the beauty of the colour and the figures, especially this young man who appears to have an elephant as his crest. He looks every inch the Charlotte Yonge hero - a very gentil parfait knight. Out of my window, I'm watching two magpies shelter from the pouring rain under a gravestone in a churchyard. Do you think they still presage joy in such a cheerless situation? I just searched the Oxford online catalogue, trying to locate a novel by Charlotte Yonge, a superb though now sadly-neglected Victorian novelist, and the system asked me if I meant to search for Charlotte Bronte. I strongly disapprove of this.